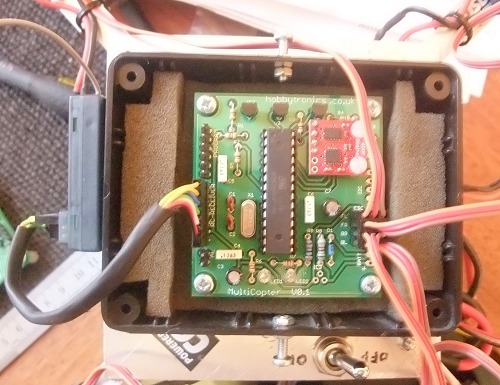 The Multicopter Flight Controller board is a general purpose flight controller designed around the schematics for the MultiWii flight software which is written for Arduino based boards. 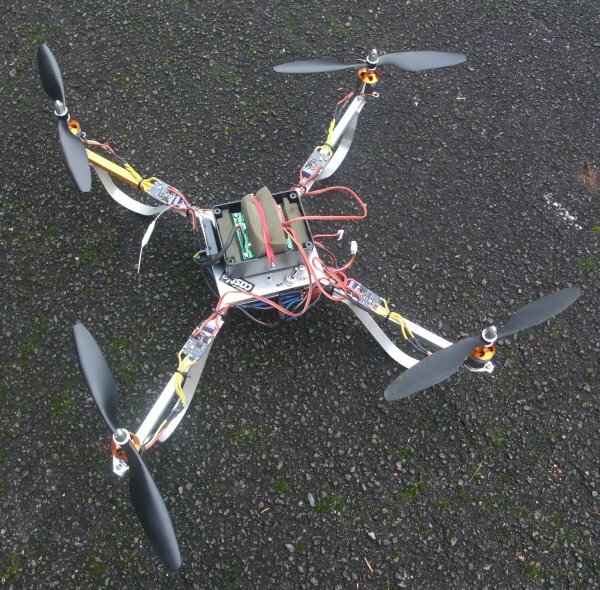 Here is a picture of our quadcopter in all its prototype glory. The board is sitting in some foam to help dampen vibrations from the motors. The frame is made from 1/4 inch aluminium tubing riveted to 2 peices of aluminium plate. There are two 11.1V Li-Po batteries wired in parallel underneath which together provide 4.4Ah. Here is the board wired up to the RC Receiver on the left, and the speed controllers on the right. That's all you need for a basic setup. This is our original prototype version of the board and differs slightly from the current version. 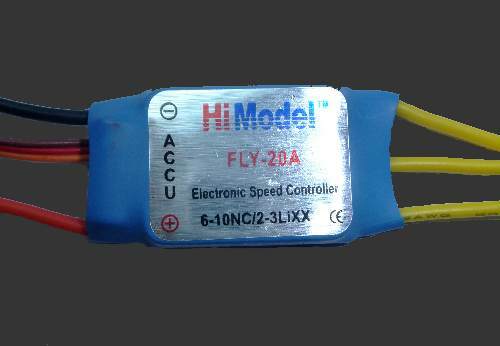 The HiModel FLY-20A are a great (and cheap) speed controller. They are happy at handling the 490Hz update frequency from the Multicopter Flight Controller board. There is one downside to these that also effects many other speed controllers. They have a low voltage cutoff that is set too high and cant be disabled. This can lead to one motor having its power reduced before the others with the likelyhood of an expensive crash. 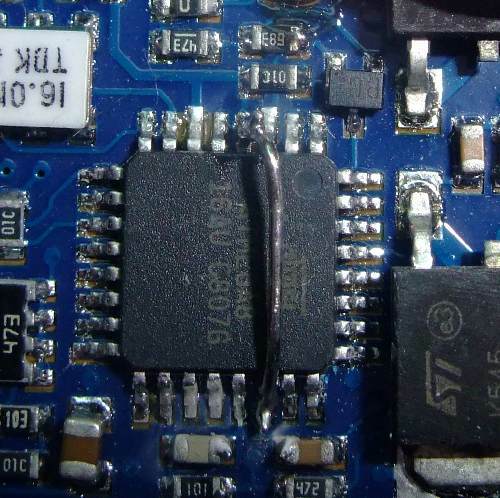 One greatl thing about these speed controllers though, is that its fairly easy to locate the ADC input that detects the battery voltage and solder a wire onto it to pull this input up to +5V. 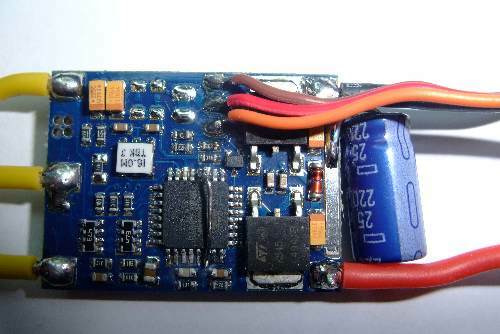 This little mod effectively disables the low voltage cutoff completely. Great news. 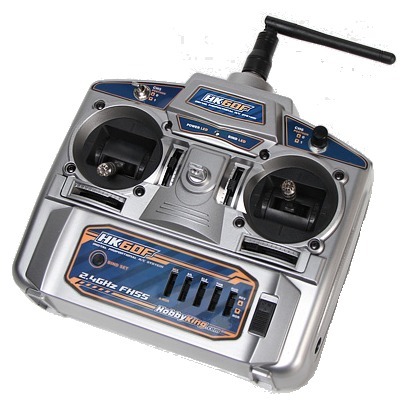 Using the MultiWii Configuration Software it is easy to adjust the settings for your particular quadcopter. All quadcopters are different, with different speed controllers, motors, wingspan (if that's what it's called), weight etc, so no one setting fits all. The roll and pitch problem was corrected by setting the I in the LEVEL to zero.